Fondly referred to as “Mr. Chocolate,” Jacques Torres is the authority on all things related to this confectionery delight. 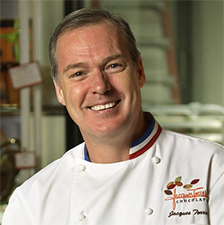 Raised in France, Jacques fulfilled his American dream in 2000 with the opening of his first chocolate store and factory, Jacques Torres Chocolate, in Brooklyn. He prides himself on fresh, handcrafted chocolates using premium ingredients free of preservatives and artificial flavors. He has served as executive pastry chef at Le Cirque for 12 years, hosted several of his own series on Food Network and PBS, and has written three cookbooks. Jacques has nine locations throughout New York City. He created the Professional Pastry Arts curriculum at International Culinary Center, where he has long served as a dean.